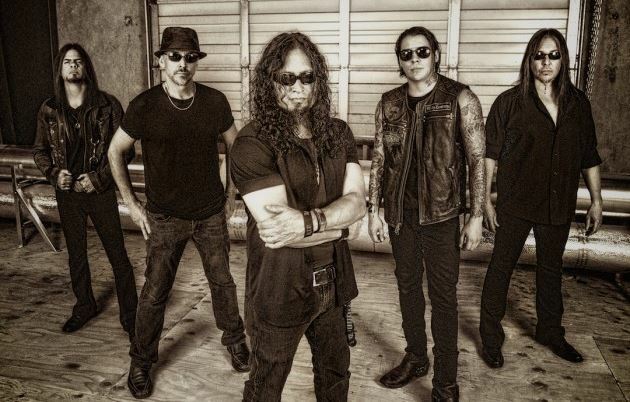 Australia's The Dwarf recently conducted an interview with QUEENSRŸCHE guitarist Michael Wilton. A couple of excerpts from the chat follow below. The Dwarf: I have to say I love the last two records, 2013's "Queensrÿche" and 2015's "Condition Hüman". The band seems to be re-energized and writing/playing the music that is not outside of the classic early QUEENSRŸCHE sound. If anything, it is a hybrid of those first three or four albums — exciting, intricate and dynamic but still remains fresh. What do you attribute that to? Wilton: [QUEENSRŸCHE singer] Todd [La Torre] just brings an element so reminiscent of when he grew up listening to QUEENSRŸCHE as well as other bands like IRON MAIDEN and JUDAS PRIEST. His forte is those albums. Todd definitely brings that to the point. Todd is very melodic, which is great, because we have to have that in QUEENSRŸCHE. He has great ideas; his lyric writing is really nice. Those early albums really hit a chord with our audience and it was a very special time in our career. As we recorded the last two albums, we tried to bring back the essence of that time, the essence of those recordings and the magic that happened. That is what is so great about "Condition Hüman". The producer, Zeuss [Chris Harris] honed in on that and really saw that in these songs. He said, "Let's go make them really interesting and let's bring back that." For example, the guitar work: let's make it more like it was when Chris DeGarmo and I were writing the songs in the early days. Fortunately, it's just something that we do naturally; it is in my DNA. All I have to do is dust it off and bring it out, and that is what Zeuss did. It is the sum element of the band. It is everyone's influences pulling and pushing, and that is what makes the band great. That is the source of the band's power right there. Once you realize that, you have to treat it with respect. The Dwarf: The evolution of your sound happened fairly quickly through the course of the first three releases. The most notable change was with "Rage For Order", which stepped away from the NWOBHM sound that you had initially. Who guided the band in a more progressive direction? How did that sound come about? Wilton: It is something that happens as you grow as musicians and the band evolves. It was everyone pushing each other to get out of the box, to create something more innovative and to make something that transcends where you have been. It was an opportunity to take a chance and believe in the collaboration of ideas. Those were early days. Everyone was in their 20s. It was just magical; it really was. We were writing the songs and then, of course, when [producer] Neil Kernon came along, he was all about it. He had just done the DOKKEN album, and he was, like, "Right. Let's really push the envelope on this album." We were doing a lot of experimental things. We were recording things outside, like slamming car doors in parking lots, bizarre sounds and that is where we went. It was good, because we had done "The Warning", which did great things for us, but it was time to move on. At that point, it was decided that we were going to be a band that evolved with each album, rather than write the same record like an AC/DC, where each album is so similar to the past one. We really wanted to evolve. Read the entire interview at The Dwarf.